Unlike Android, Apple barely allow users to replace their Default/Stock apps with a third part ones, so the Phone, Messaging and E-Mail apps will remain the same and you will have to stuck with them, Of course if your device is not Jailbroken. Once your device is Jaibroken you can do a lot of things that seems impossible in the first sight on Apple Devices including the replacement of default Messaging app in iOS 7. Thanks to BiteSMS and the Team behind it, now users of iOS 7 can replace the Stock Boring Messaging app and use a brand new BiteSMS app, which is of-course only for Jailbroken devices.With tons of new features, including quick reply and quick compose, adding contact pics to the messaging threads, and tons of customization options, it’s worth checking out and the Best Part it is Free. 0.1 Jailbreak your iOS Device. Tap Manage at the Bottom. Navigate to Edit at bottom. Tap on Add on the Left. Enter the Following in the Text Field, http://test-cydia.bitesms.com, and hit Add Source. Tap BiteSMS once the search is over. 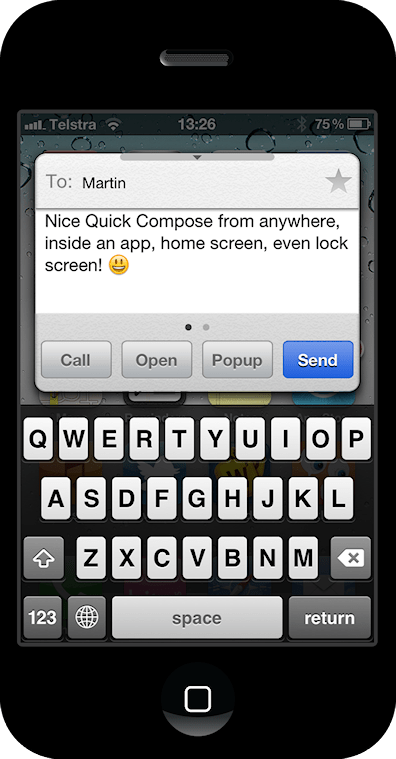 Open BiteSMS from the spot where your Previous messaging app was. Tap Settings and on the left of Search bar.